The U.S. Department of Agriculture’s Prospective Plantings report indicates that farmers nationwide could be looking to soybeans as a financial safe haven in a difficult market, Purdue University agricultural economist Chris Hurt says. The number of soybean acres could reach an all-time high in 2015 while corn acreage is expected to decline for the third year in a row, according to the report issued Tuesday (March 31) by the U.S Department of Agriculture. Soybeans are also comparatively cheap to plant, Hurt said. The U.S. soybean market has been gaining strength in recent years largely due to increased exports to China, Hurt said. The annual report showed that farmers across the country expected to plant 89.2 million acres of corn this year, down 2 percent from last year but more than some analysts expected. Producers planned for 84.6 million acres of soybeans, which would break last year’s record of 83.7 million acres. Winter wheat was expected to account for 40.8 million acres, down 4 percent from 2014. The report, based on a nationwide survey of 84,000 farmers, was conducted in March. Regional responses mostly mirrored the national trends. Producers in Indiana expected to plant 5.8 million acres of corn this year, down 2 percent from 2014. Ohio growers said they would plant 3.5 million corn acres, down 5 percent. In Indiana, farmers said they would plant 5.6 million acres of soybeans, up 2 percent from last year. 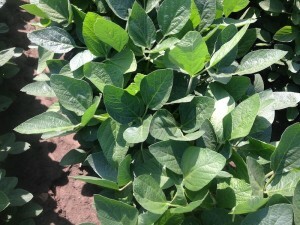 Ohio farmers planned on 5.1 million acres of soybeans, a 5 percent increase. Farmers in Indiana said they would put in 340,000 acres of winter wheat compared with 390,000 acres last year, a drop of 13 percent. Ohio farmers planned on 550,000 acres of winter wheat this year, down 11 percent from last year’s 620,000 acres. Hurt said corn prices fell after the release of the Prospective Plantings report, and another USDA report the same day showing corn stocks left from the 2014 crop were about 115 million bushels more than expected. “The combination of more old-crop corn than expected and more 2015 acres than expected was a one-two punch depressing corn prices,” Hurt said. In its quarterly Grain Stocks report, the USDA said soybean stocks totaled 1.33 billion bushels on March 1, up 34 percent from the same time last year. The amount of corn in storage totaled 7.74 billion bushels, up 11 percent from 2014. All wheat stocks totaled 1.12 billion bushels, up 6 percent from last year.